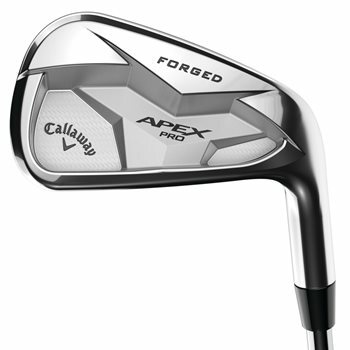 The Callaway Apex Pro 19 iron is Callaway’s first ever Tour performance iron with advanced distance technologies for better players who want all the benefits of a Tour-level design without sacrificing ball speed or distance. Extremely soft feel comes from a forged 1025 mild carbon steel body with urethane microspheres that absorb unwanted vibration without slowing the face. The 360 Face Cup promotes high ball speeds across the face for long, consistent distance in the long and mid irons while the spin control VFT Face in the short irons allow for aggressive shot-making. To further enhance the level of scoring performance and shot-making that the pros demand, an average of 50 grams of Tungsten has been infused into each iron for exceptional ball flight and pinpoint control. All of this innovative performance technology is crafted into into a premium design with beautiful progressive shaping and a classic Apex finish.